1800SPM 4 V-Track Rollers, Stitch Regulation, Encoders, Front Handles, OLED Panel, M Bobbins. "I purchased a qnique mid arm first , I’ve never used or seen one before this , I was really impressed with how fast it arrived , I set it up with the frame by myself , it went together easily, (I am 81 yrs old ) I learned to quilt on it fast , I like it so much I decided to get the rear handles , too much fun , and easy to use , thank you, Ray M, Alvaton KY"
Did you know that the Qnique Laser Stylus accessory can be easily attached to the machine to help you trace patterns or pictures while you are quilting on a quilting frame? You have the choice of attaching the laser to the front or rear handles, or even to the bottom of the machine, between the wheels. 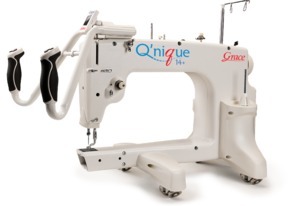 The Grace Q'nique 14+ Long Arm Quilting Machine will take your quilting to a whole new level. With a 15 inch throat space theGrace Q'nique 14+ 15R 15x8" Long Arm Quilting Machine gives you the freedom to quilt larger patterns or quilt blocks. 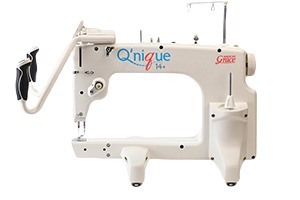 TheGrace Q'nique 14+ Long Arm Quilting Machine includes stitch regulation, extended throat space, advanced control setting, easy grip handles, and increased stitch speed. The Grace Q'nique 14+ 15R 15x8" Long Arm Quilting Machine is brought to your by the Grace Company, which had been manufacturing and distributing quilting frames and accessories for over 25 years. wants to later upgrade their manual speed machine to be stitch-regulated. 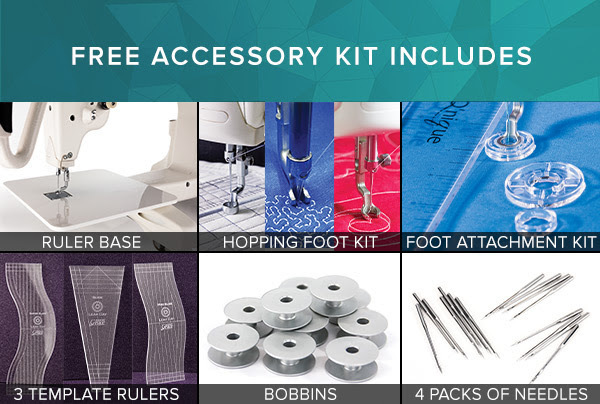 *All through March 2019, get a FREE 6 pack of accessories with your Q'nique 15R purchase! A $500 value with free shipping.